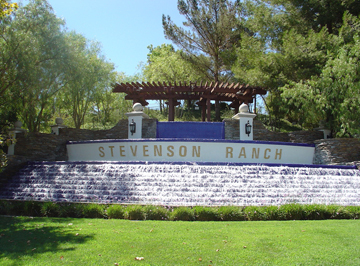 Stevenson Ranch is a census-designated place in Los Angeles County, California. The community is located in the Santa Clarita Valley. Often incorrectly referred to as part of the city of Santa Clarita, the community does not actually fall within the Santa Clarita city limits and is instead in an unincorporated area. It has many new suburban ones- and two-story houses in new developments, with a median value of $1,034,600. Stevenson Ranch encompasses about 6.4 square miles. About 1,000 acres are set aside as parks, recreation areas, and open space. Stevenson Ranch is set in the foothills of the Santa Susana Mountains and lies west of Interstate 5. One of the newer communities in the Santa Clarita, which was ranked number 18 of the top 100 places to live by Money Magazine in 2006, this area backs up to the historic, oil-mining town of Mentryville, founded in 1875. A master-planned community, it was approved by the county in 1987. The population was 17,557 at the time of the 2010 census. It is home to the award-winning California Distinguished and National Blue Ribbon Schools Stevenson Ranch Elementary, Pico Canyon Elementary, Rancho Pico Junior High, and West Ranch High School, The Valencia Marketplace and Stevenson Ranch Shopping Center are popular shopping areas in the community. Six Flags Magic Mountain, an amusement park, is located about three miles north of the community. The names of many streets located in Stevenson Ranch are those of famous authors (e.g., Thackeray). It is also the filming location of several films and television productions, including the television show Weeds, a Showtime original series, as well as the feature film Pleasantville. Its master-planned nature is at the heart of the suburban commentary of Weeds, such as the Little Boxes song and sprawling development portrayed in the opening of the show.